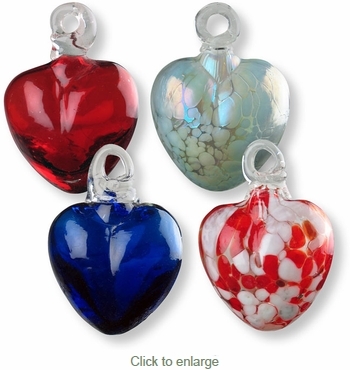 These Mexican blown glass hearts are the perfect way to say what’s in your heart. Give them as a one of a kind ornament, unique hostess gift, token of appreciation or just because. Hand crafted by master glass artists, these hand blown glass hearts are a tribute to the skill and history of Mexican glass work. As with all of our hand crafted folk art items, expect some variation in size and color with our hand-blown glass ornaments. Sold in sets of 2: Available in solids and patterns and in a wide variety of colors. See choices at left. To mix colors, place your first color choice in your shopping cart and indicate your second color choice in the comments section on the checkout page.